The design of a truly killer video conference space considers these elements in combination, not isolation. The first question to ask yourself is: What is the purpose of this room? Will it strictly be for video conferences or will it have multiple uses? As it will most likely have multiple uses, what are those uses? Other types of meetings, training, office parties? Now that you’ve identified the purpose of the room before moving on, ask yourself if the space will meet the requirements necessary to fulfill that purpose. For example, if you want to use the room for all-hands meetings make sure the room is large enough to comfortably host all your employees. If the space doesn’t meet the requirements to fulfill its purpose, find a different space. Next, what furniture does the room contain, and how portable is it? A single large conference table with chairs set in the middle of the room will have different requirements than a collection of fold-away tables that are regularly rearranged. Obviously, a room the size of a hotel ballroom will need different (and more) equipment than a small personal office. Both spaces can work brilliantly for video conferencing, as long as the size of the space is considered as part of the design. Balancing natural light with ceiling light can reduce shadows which can spoil the meeting experience for your virtual guests. Neutral gray colors on walls and tables improve color appearance. Avoid completely white walls or tables, a color with refection value (LRV) of 50 percent is recommended. Doors impact display placement because you never want your display blocked by an open door. Additionally, if you do not want to distract remote attendees with people entering or leaving the room, how you place displays and cameras will depend on the door location. What are the walls, ceiling, and floor made of? Presumably, at least one wall will have windows. At any time of the day will presenters be looking into the sunlight or be backlit and in shadow? Large, flat, hard surfaces reflect sound, causing audio havoc. An area rug on a hardware floor can do wonders. Similarly, artwork or dampening boards can take the sound bounce out of concrete walls. Glass walls reflect sound and light and require extra thought into equipment placement. Desk microphones may be all you need in a moderate sized conference room with an unmoving table. However, ceiling microphones would probably better serve rooms with a more dynamic layout. Multiple microphone setups as well as an array of speakers are common for larger rooms and rooms that serve multiple purposes – such as training or all-hands meetings. Additionally, adding video conferencing to a room that already has an integrated system may require disabling one system for another. How many screens and of what size do you need? Again, room size and purpose are key. While that small personal office may limit your video options, multiple screens can improve the experience for large in-house meetings or when there are a multitude of virtual guests. And, you may want a separate display exclusively for the presenter so that they can see their presentation. Placement of screens needs to consider window location as well as people arrangement. Since cameras are generally located on or near screens, you want your participants to be able to comfortably look at them so as to “face” the other meeting attendees. 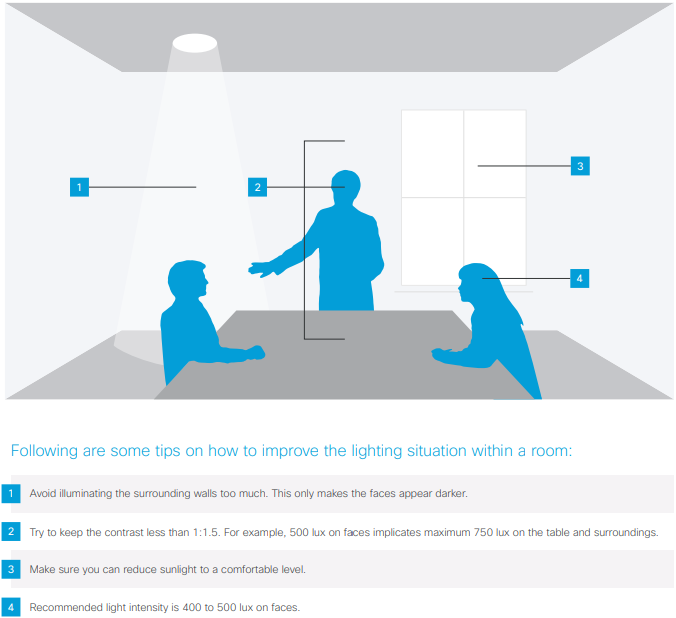 A poorly placed screen and/or camera can leave a presenter in shadow or looking into a glare. Similarly, if the in-house audience is at an angle to the display, you can end up with uncomfortable attendees and/or awkward camera shots. Technology is amazing, there are few spaces that cannot be transformed into killer video conference rooms. However, before you start buying equipment, understand your space, its uses, and your needs. Play with multiple layouts and try to think of everything that could disrupt your conference that better placement could prevent. Are you wondering where to start, or do you find yourself stuck? 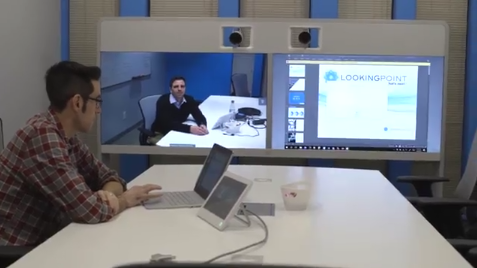 The professionals at LookingPoint are available to answer all of your video conferencing questions.